For the Etruscan deity, see Atlas (mythology) § Etruscan Aril. For the Malaysian singer, see Aril (singer/actor). Not to be confused with aryl, a type of organic chemical radical. An aril (pronounced /ˈærɪl/), also called an arillus, is a specialized outgrowth from a seed that partly or completely covers the seed. An arillode or false aril is sometimes distinguished: whereas an aril grows from the attachment point of the seed to the ovary (from the funiculus or hilum), an arillode forms from a different point on the seed coat. 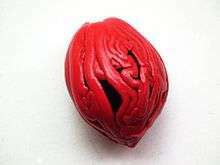 The term "aril" is sometimes applied to any fleshy appendage of the seed in flowering plants, such as the mace of the nutmeg seed. Arils and arillodes are often edible enticements, encouraging transport by animals and thereby assisting in seed dispersal. Pseudarils are aril-like structures commonly found on the pyrenes of Burseraceae species that develop from the mesocarp of the ovary – the fleshy, edible pericarp splits neatly in two halves, then falling away or being eaten to reveal a brightly coloured pseudaril around the black seed. The aril may create a fruit-like structure (called a false-fruit). False fruit are found in numerous Angiosperm taxa. The edible flesh of the longan, lychee, ackee and lleuque fruits are highly developed arils surrounding the seed rather than a pericarp layer. Such arils are also found in a few species of gymnosperms, notably the yews and related conifers. 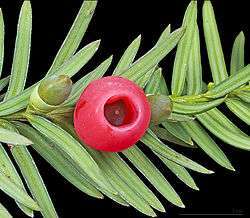 Instead of the woody cone typical of most gymnosperms, the reproductive structure of the yew consists of a single seed that becomes surrounded by a fleshy, cup-like covering. This covering is derived from a highly modified cone scale. In the photographs of a European yew (Taxus baccata) below, the aril starts out as a small, green band at the base of the seed, then turns brown to red as it enlarges and surrounds the seed, eventually becoming fleshy and scarlet in color at maturity. The aril is attractive to fruit-eating birds and is non-toxic (all other parts of the yew are toxic), serving therefore to promote dispersal of the yew seed by birds, which digest the fleshy aril as a food source, and pass the seed out in their droppings. The kahikatea tree, Dacrycarpus dacrydioides, is native to New Zealand. In pre-European times the aril of the kahikatea was a food source for Māori. The washed arils were called koroi and were eaten raw. ↑ Endress, P.K. (1973). "Arils And Aril-Like Structures In Woody Ranales". New Phytologist. 72 (5): 1159–1171. doi:10.1111/j.1469-8137.1973.tb02092.x. ↑ Ramos-Ordonez, M. F.; Arizmendi, M. D. C.; Marquez-Guzman, J. (2012). "The fruit of Bursera: Structure, maturation and parthenocarpy". AoB Plants. 2012: pls027. doi:10.1093/aobpla/pls027. PMC 3484315 . PMID 23115709. ↑ "Dacrycarpus dacrydioides (kahikatea) description". conifers.org. 2011. Retrieved 10 September 2011. 'The small fruit (koroi) are superabundant and highly nutritious. The birds ate them and flocked for miles to do so. ↑ "Kahikatea, Dacrycarpus". web.auckland.ac.nz. 2011. Retrieved 10 September 2011. The juicy, swollen, red stalk which holds the seed is known as koroi.